This mix of brown rice and nuts works great as a side dish, and is hearty enough to hold its own as a meal's centerpiece if you're up for a simple, vegetarian dinner. 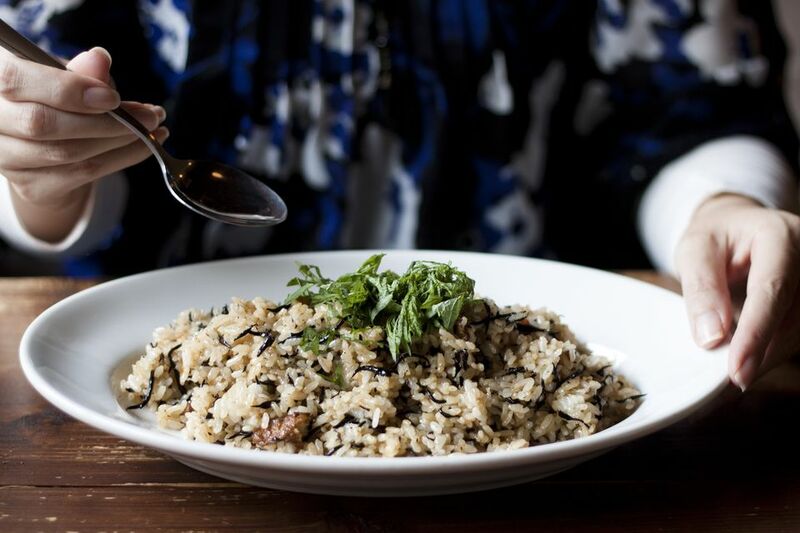 In either case, this Nut Rice Pilaf goes perfectly with a fresh tossed green salad. One warning: pay a lot of attention during step 2: nuts can go from being toasted and delicious to being burnt and disgusting if you're not paying attention. Watch them, stir them a lot, and be ready to add the spices and rice if things start moving faster than you'd anticipated. Prep notes: Peel and finely sliced the onion or shallots. Peel and mince the garlic. Roughly chop the nuts. Measure out the spices into a small bowl so they're ready to add. Measure out the wine and broth. Mince the parsley. Heat a large frying or saute pan with a tight-fitting lid over medium-high heat. Add the olive oil, swirl the pan to coat it with the oil, and when the oil is hot (it will shimmer a bit), add the onion and the salt. Cook, stirring frequently until the onion is soft, about 3 minutes. Increase the heat to high and add the nuts. Cook, stirring constantly, until the nuts start to toast. The onions will brown a bit, which is good; if they start to burn or char at all reduce the heat and move to the next steps. Evenly sprinkle on the coriander, cumin, and pepper. Cook, stirring, until fragrant, about 30 seconds. Add the rice and stir to combine--the rice should be well coated with the oil and the onions. Pour in the wine and cook, stirring, until the rice can completely absorbed the wine, about 2 minutes. Slowly pour in the broth and bring to a boil. Cover, reduce the heat to low, and cook until the rice is tender to the bite, about 50 minutes. Fluff the pilaf with a fork. Add salt to taste, if needed. Stir in the minced parsley and garnish with whole leaves, if you like. Serve the rice pilaf hot or warm (the range of possible temperatures here makes this an excellent option for buffets).